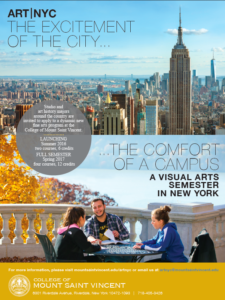 ART|NYC is a Summer and Spring residential program in New York City for undergraduate visual arts majors. This affordable new program offers students around the country the experience of a world cultural capital while pursuing a focused course of study in a supportive academic environment. ART|NYC Semester is a 4-course, 12-credit program that will launch in Spring 2017. The program features studio and art history courses, trips to museums and galleries, and conversations with a range of New York art professionals. The College of Mount Saint Vincent is located in the Riverdale section of the Bronx. Students have ready access to the city’s collections and resources while living and studying on a picturesque, 70-acre campus overlooking the Hudson River. ART|NYC is aimed at undergraduate art students who will achieve junior standing or higher by the time of enrollment. Apply online for the Summer 2016 program by March 31, 2016.